You must follow signs through the back roads off the main highway running from Rome to Florence. The scenery is charming and lush, old villas and olive groves abound. Upon arrival we were greeted by Lucia and taken to our apartment. It was spacious, clean and lovely. A well stocked kitchen with a great view of Umbria below. We stayed in a large apartment with 3 bedrooms and 3 bathrooms and the living room was equipped with a flat screen and Sky TV—in English! We have never found English television in our European travels, so this was a luxury for us. We are city people. We not only live in a city, but our vacations are typically city vacations. This was a nice change of pace for us. Our kids were able to pick tomatoes and squash and then we went on a hunt for the Saffron flower with Lucia. Our family’s favorite thing about Fontanaro is, in fact, the owners themselves, Lucia and Alina Pinelli. They are friendly, knowledgeable and helpful beyond measure. No task is too big, or too small. They suggested special activities for the kids such as the annual Euro Chocolate Festival in Perugia (a mountain top town with a Mini Metro that goes up a hill and through some tunnels) and a traveling carnival, Luna Park which were trip highlights. Alina invited us into the kitchen to cook the afternoon Sunday meal with her and some other guests who were staying at the farm. While cooking she gave us a lesson on olive oil that I’ll not soon forget. We learned that olives should be grown; harvested and processed in the same location and that the end product should smell like cut grass and be a deep yellow in color. Then we tasted several olive oils that illustrated her point about the difference in taste and nutrition. Fontanaro is a place where kids can have some freedom to safely run around and play. Our villa had a great kitchen and was spacious, well laid out, and comfortable for a family. Although we didn’t get a chance to cook a meal in our kitchen, it was definitely set up to do so. Accommodations are simple but functional. There are limited amenities for kids other than the seasonal swimming pool, a ping pong table, and a swing. Our kids also liked checking out the bee hives. > Italy’s restaurant hours are hard for kids as they don’t open until 7:30p. Plan on eating in if you want the kids to get to bed early. > Driving in the countryside can be confusing. GPS and/or Google maps are very helpful. Need Help Planning a Family Vacation to Italy? We can help! Our Family Vacation Consultants can do everything from booking accommodations, to developing full itineraries including kid-friendly activities. Request assistance on My Trip Planner. Editorial Note: Fontanaro provided a media rate for this stay. As always, our opinions our our own on Ciao Bambino. Photos by Kirsten Gaddis except exterior photo of the property. I am always so happy when I find an article about great travel experience with kids in our beautiful region! 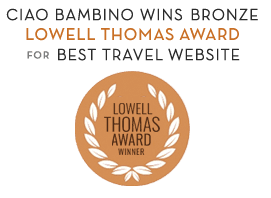 and I just love the motto “Those who want to find it, will.” Being Umbria itself not always considered by first timers traveller to Italy…it seems just perfect to me! I’ve been there last summer and was great! I really think this is a real way to experience Italy!